2U (3.5" or 889mm) height. 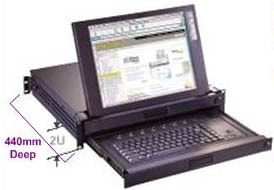 Double sliders with independent slider for LCD Panel and keyboard/mouse tray. Great feature to allow viewing even when glass door of cabinet is closed. Maximum saving on rack space. Able to mount to minimum 600mm deep cabinet. LCD Panel size 15" 15" 17" 17"